Mole damage can be very frustrating and most people's first thought is to buy some kind of poison to solve the problem. We do not recommend this because it creates a risk for non target animals and we have found that they do not work. We have found the best way to solve mole problems. We are able to help with any Tigard Mole Control problem and also setup a maintenance plan if needed. Mole's can be found not only in residential areas, but also in farm fields and other large commercial properties. These areas can be over run quickly if not controlled properly. We are able to handle any size job and always work with the customer to make sure they are satisfied. When mole hills are left in the yard and not removed and the moles taken care of, the grass can die causing a lot of damage. If you have a mole control problem in Tigard feel free to contact us for help or more information. Mole Gopher Vole I have no idea!! 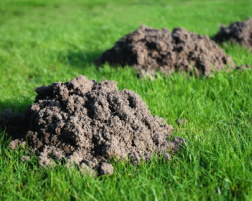 Tigard mole trapping services should be handled by a professional mole control company. Some business will charge to spread poison or repellent, but we do not think this works. 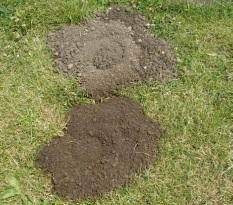 We have found that using mole traps is the best way to stop damage on your property. When you kill and physically remove the moles it is a sure way to end dirt mounds. It is also the best way to get your lawn back to having grass. We are able to provide professional mole trapping in Tigard. It you have a mole that is destroying your yard contact us today. Tigard Gopher Removal can help stop damage to your yard, garden, or field quickly. Gopher's and moles are often thought to be the same thing by alot of people, but they are very different. Gopher's are much larger and eat plant's and roots. Mole are smaller and eat grubs's and worms mostly. Since there is such a size difference, you need to us different traps to solve the problem. We have many different traps and methods to solve gopher problems. Most people have never even heard of a vole, until they have a problem in there yard. Vole's can cause a lot of damage and reproduce quickly if they are not controlled quickly. Like moles and gophers, we use a trapping plan to control our customer's vole problems. Vole's are very similar to mice, but they have a smaller tail and round ears. They dig golf ball sized holes (as shown in the picture) and eat the grass around the top. You will often seen worn trails above ground that run from hole to hole.